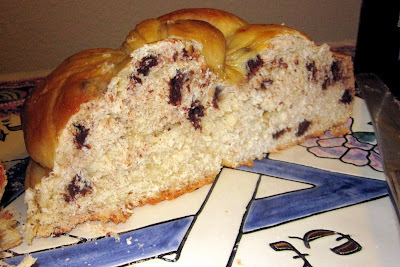 This vanilla challah is my mom's favorite challah recipe and I love it, too. It's a great one to add chocolate chips to, so I did that for two of the three loaves. Come on, vanilla + chocolate in egg bread? Heaven!!! This is the challah recipe we served at my sister's August wedding. For the wedding, we shaped the challah into rolls to serve in bread baskets for each table. Perhaps you recall from a previous blog post that my mom and cousin Rachael spent an entire day making hundreds and hundreds of rolls. Yup, they were these Beth Hensperger babies! Hensperger is a bread mastermind, and maybe we're a little biased because she's also a Northern California local. Her book The Bread Bible really is just that to so many people. 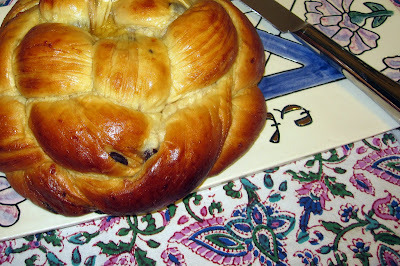 The round braid shape featured in this blog post (which is not from Beth Hensperger's recipe) is perfect for Rosh Hashanah, but it's fun and special to do any time of year. And it's so easy! When I first saw step-by-step photos on the Orthodox Union website, I thought I'd never figure it out. But once it connected for me, I laughed at myself for ever calling it impossible. Hopefully my photo demonstrations show the steps easily enough, but I promise you, if you spend a few extra minutes, you will figure it out and be so happy you did! In a large bowl or mixer, combine the yeast, sugar, salt, and 2 cups of flour. Add the hot water, eggs, oil, and vanilla. Beat hard until smooth, about 3 minutes. Scrape down the sides of the bowl occasionally. Add remaining flour, 1/2 cup at a time, switching to a wooden spoon when necessary if making by hand. Continue beating until the dough is too stiff to stir. Turn dough out onto a lightly floured work surface with the plastic pastry scraper and knead until soft and springy and a layer of blisters shows under the skin, about 4 min. Dust with flour only 1 tablespoon at a time as needed to prevent sticking. The dough needs to be slightly firm for free-form loaves. If kneading by machine, switch from the paddle to the dough hook and knead for 3 to 4 minutes, or until the dough is smooth and springy and springs back when pressed. If desired, transfer the dough to a floured surface and knead briefly by hand. Place dough in a greased deep container. Turn the dough once to coat the top and cover with plastic wrap. Let rise at room temperature until doubled in bulk, 1 1/2 to 2 hours. Grease or parchment-line 1 or 2 baking sheets or the springform pans. Gently deflate the dough. Turn the dough out onto a lightly floured work surface. Divide the dough into 2 equal portions. Roll each portion out into a smooth, thick strip about 30 inches long, with 1 end 2 to 3 inches wider than the other. Roll to lengthen and taper the thinner end. With the wide end on the work surface, lift the tapered end and wind the rest of the dough around the corner section 2 or 3 times, forming a compact coil. Pinch the end and tuck it under. Place the coils, with the swirl pattern facing up, on the baking sheets or in the springform pans. Cover loosely with plastic wrap and let rise until almost doubled in bulk, 30 to 40 minutes. Because of the eggs, this loaf does not need to double completely; it will rise enough in the oven. Twenty minutes before baking, preheat the oven to 350 degrees. To make the vanilla egg glaze, in a small bowl, whisk together the egg yolk, vanilla, and sugar. Beat until well blended. Gently brush the dough surfaces with a thick layer of the glaze. Place the baking sheet or pans on a rack in the center of the oven and bake 40 to 45 minutes, or until a deep golden brown and the loaves sound hollow when tapped with your finger. Carefully lift the turbans off the baking sheets with a spatula and transfer to cooling racks. If using the springform pans, release the sides and then carefully remove the turbans from the pan bases. Cool completely before slicing. Here's the plain dough after it's doubled in size. Time to shape into a loaf! Notice there are two strands on each side that work like pairs (and there are four pairs). Take the strand that is "the under," not "the over," and cross it over its pair so that if it was facing down before, now it is facing right (a new direction). It now belongs to a strand from a different pair. Continue crossing strands over their pairs, alternating clockwise and counterclockwise for each cycle. Now let's try the exact same process with the chocolate dough! Look how big they got because of the eggs in the dough! As you said, this is my absolute favorite challah recipe! Braided with your technique, I've never seen or tasted a more perfect loaf! Your step by step pictures are excellent,too! Very impressive!!! I'm going to send this on to my sister, the wedding cake/challah baker. The braid is simply beautiful. And I know how delicious the challah is! Linda sent me this and I can't wait to try it this Shabbat! Mom - Thank you so much for introducing me to this recipe! I am going to make it again and again and again! Linda - Thanks. You and your sister should both try out this braid. You're both so talented!! Vicki - I can't wait to hear how it turns out. I'm sure it will be gorgeous! My god this looks good. Since I'm no baker...can I request one so I can at least participate a little bit in the holiday? Do it for your ancestors!